Our product range includes a wide range of unprinted stand up pouches, flour food packaging materials, chocolate food packaging materials, cheese food packaging materials, cold seal roll food packaging materials and snack food packaging. We are offering Unprinted Stand Up Pouches to our clients. 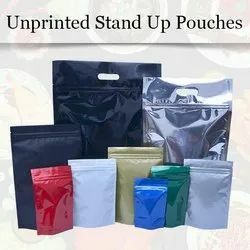 What are the different type of products can be packed in blank stand up pouches. Keeping track with latest market development we are actively engaged in offering premium quality Chocolate Food Packaging Materials. The offered materials are manufactured with the help of finest quality plastic and modular technology, under the direction of skilled professionals. Provided materials are used for packing of chocolates. Clients can avail these materials from us as per their necessities, in various specifications at market leading prices. 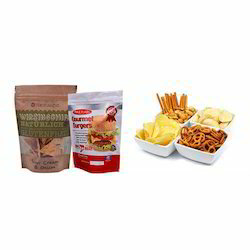 We are an unparalleled name in offering a premium quality range of Cheese Food Packaging Materials. The offered materials are manufactured under the guidance of our skilled professionals with the help of latest tools and technology to ensure flawless at users’ end. In order to ensure quality, these materials are strictly tested on various parameters. We offer these materials in various shapes, sizes, designs and sizes. Clients can avail these materials from us at market leading rates. In order to meet the diverse needs and demands of our clients', we provide a high quality array of Cold Seal Roll Food Packaging Materials. Crafted using optimum grade raw material and latest technology as per the industry standards, these materials are available in varied sizes, colors and designs. These materials can be availed in various customized options to meet the exact requirements of the clients'. We deliver these materials at pocket friendly prices in prompt manner. 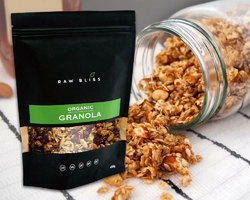 We are offering Snack Food Packaging to our clients.